After you mark all the words and phrases that you want Word to use as your document’s index entries, the process of generating the index is pretty easy. 1Move the insertion point to the place where you want the index to appear. The index generally begins on a new page near the end of the document. 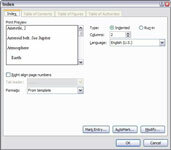 Press Ctrl+Enter to create a new page if necessary, and click to position the insertion point on the empty page. You might want to add a heading, such as Index, at the top of the page. 2Open the References tab on the Ribbon and then click the Insert Index button found in the Index group. The Index dialog box appears. 3Select the index style that you want from the Formats drop-down list. 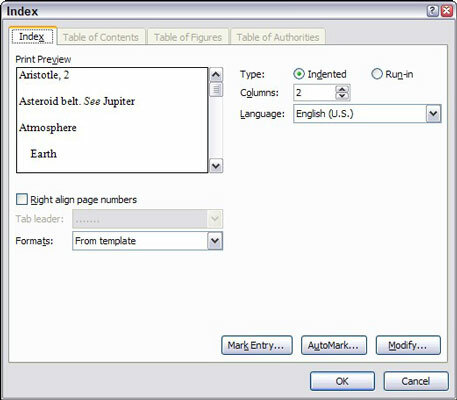 As you click the various formats, the Print Preview area shows how the resulting index will appear.